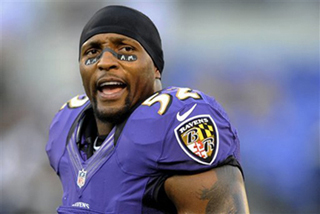 Ray Lewis spent 17 seasons instilling fear in his opponents while serving as an inspirational leader for the Baltimore Ravens. Now he’s poised and eager to become a full-time dad. Lewis announced Wednesday he will end his brilliant NFL career after the Ravens complete their 2013 playoff run. Lewis has been sidelined since Oct. 14 with a torn right triceps. The 13-time Pro Bowl middle linebacker intends to return Sunday to face the Indianapolis Colts in what will almost certainly be his final home game. Lewis will walk away from the game because he wants to spend more time with his sons. While working to return from his injury, Lewis watched two of his boys play on the same high school football team in Florida. He intends to see Ray Lewis III perform as a freshman next year for the University of Miami, where the elder Lewis starred before the Ravens selected him in the first round of the 1996 draft. That’s why Lewis will pull off his No. 52 uniform for the last time after the Ravens lose or claim their second Super Bowl title. Lewis has been with the Ravens since they moved from Cleveland. After being drafted 26th overall in Baltimore’s first draft, Lewis became a fixture at middle linebacker - and a beloved figure in Baltimore. He remained that way even after his alleged involvement in a double-murder in Atlanta in early 2000. “I got to be there every Friday,” Lewis said. “Me being who I am, not having a father myself, that damaged me a lot. I didn't want my kids to relive that.